Prepare yourselves for a rave post! I've fallen for this little lip balm ever since the lovely Laura sent it to me a few weeks ago after she had a Birchbox mixup. 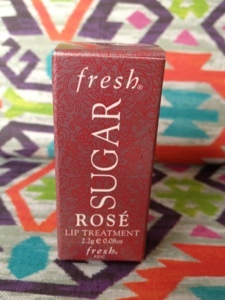 Fresh's Sugar Rose Lip Treatment is a citrus scented, slightly tinted, lip balm. Made by natural products brand Fresh, the lip treatment offers hydration, a hint of colour and and SPF 15. I have to be honest, I love everything about this product. The packaging is really sturdy - the balm is encased in a metal tube with a twist off lid, so there's no chance of it accidentally popping off in your bag (I'm looking at you Balmi). It smells good enough to eat, and keeps my horribly dry winter lips moist for hours. The only downside to this product is the price. The full size retails for approximately £15 ($22.50), so is pretty expensive for a lip balm. They are also quite hard to come by in the UK as Fresh only have one UK store and you have to call to make an order as the website is for US buyers. All that aside, it's taken the top spot in my lip balm loves and I can fully see myself buying another when this one finishes, even if I am crying slightly at the thought of paying £15 for another one. Have you tried anything by Fresh before? I bought some of this back from NyC! 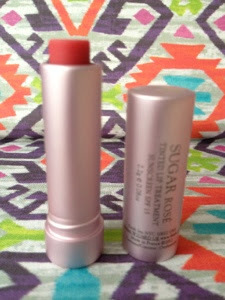 Expensive but the best lip balm I've ever used! !